Singer, Dammy Krane has weighed in on the controversial issue involving Shatta Wale of Ghana, and Wizkid. The Ghanaian Dance hall artiste had earlier claimed that he does not consider Wizkid as a superstar and Dammy Krane seems to agree with him, especially on the point that Wizkid is overrated. Dammy Krane’s tweet has since earned him the title of a traitor and Nigerians have begun trolling the controversy-prone singer. An onliner user with the handle @Nycewizy mocked the singer by stating that his last hit was way back when he (Dammy Krane) released Amin. @Nycewizy went on to say that Korede Bello has surpassed Dammy Krane, even though the Mavin Records signee was only a teenager when Dammy Krane started his music journey. 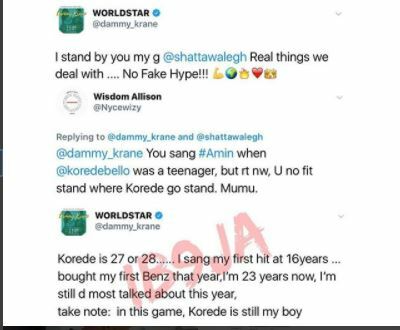 Dammy Krane however had the last words which he used in calling Korede Bello his boy and bragging about being “the most talkedabout this year,” among other things.